As an experienced musician, I have been playing guitar for over 18 years and have studied at both the Academy of Contemporary Music and University of Liverpool. For the past 7 years I have been teaching electric guitar offering an enthusiastic, professional and tailored service for a variety of ages and abilities, from beginner to advanced. Teaching takes place in Finchampstead, near Wokingham, Berkshire, Monday to Friday. An advanced guitar player who has helped me to understand all the theoretical and technical aspects required to master the guitar. James’s enthusiasm, encouragement and patience ensures that I master each step of the guitar at a steady pace, while at the same time pushing me up to the next level. I can’t believe how much I have learned in a short time when I look back at my daily practice log. James’s 3 month progress reviews have helped keep me on track, and in my first assessment I gained a high score which reflects good tuition and guidance . My teenage son has been thoroughly enjoying electric guitar lessons with James for over 18 months now. James keeps him interested, enthused, doing something different every week, and making good progress. Just the thing for an aspiring young heavy metal axe-man – rock on! I have had lessons from James for some time, he has made the learning process good fun, and uses technology (see his online youtube videos) to make the most of the experience. I have really enjoyed lessons with him, he is always professional and personable. James taught my 8 year old Daughter for just over a year, when she started she was a complete beginner, James encouraged her and gave her very realistic goals to achieve. 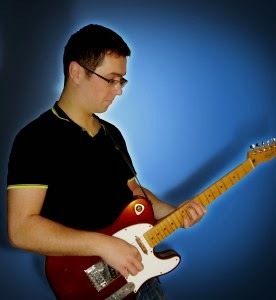 James is a talented guitarist and his lessons are very informative and professional yet very casual and comfortable. I would 100% recommend James to anyone of any skill level and age.